A really enjoyable morning. Parking was easy underneath the new library (opened the beginning of 2018) which is opposite the huge Shellharbour Stocklands. My mum came with me and together we carried my resources into the library to meet up with Alison – the Shellharbour Council Environment Officer. Wow! What a beeee..a..utiful (couldn’t resist that when the focus is on pollinators such as bees!) 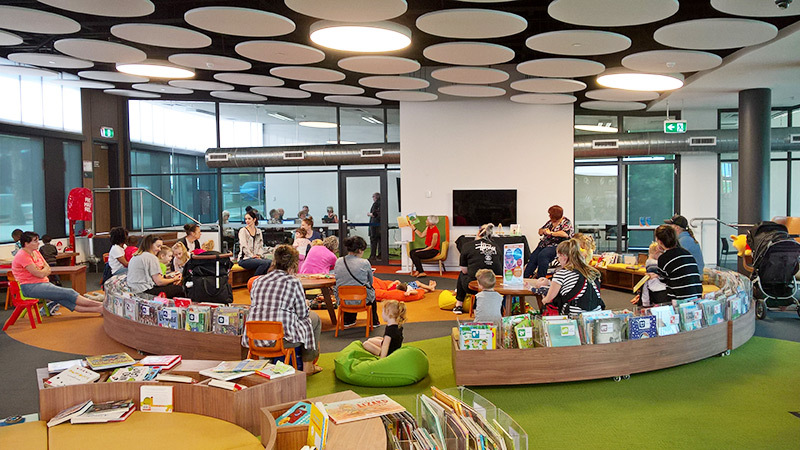 library – spacious, curved shelving, lots of glass, a cafe and a large area for the children to sit and interact during story sessions. A must – visit! The babies/toddlers were just finishing off their session as I set up. Alison displayed a table of materials about pollinators for parents and children to peruse. The ‘bee hotel’ and illustrations about native bees were particularly engaging. Prue, the Children’s Librarian and Donna were really helpful in orientations and setting the scene.. and soon the story session was off and away. The children joined in songs, drama and finger rhymes as I read through my story ‘While Mandy Waited.’ The Pollinator craft held the children’s attention and then it was time to say goodbye. Keen to return for more. Thank you Alison, Prue, Donna and my mum, Ann. Join thousands and receive my best stuff in your inbox.